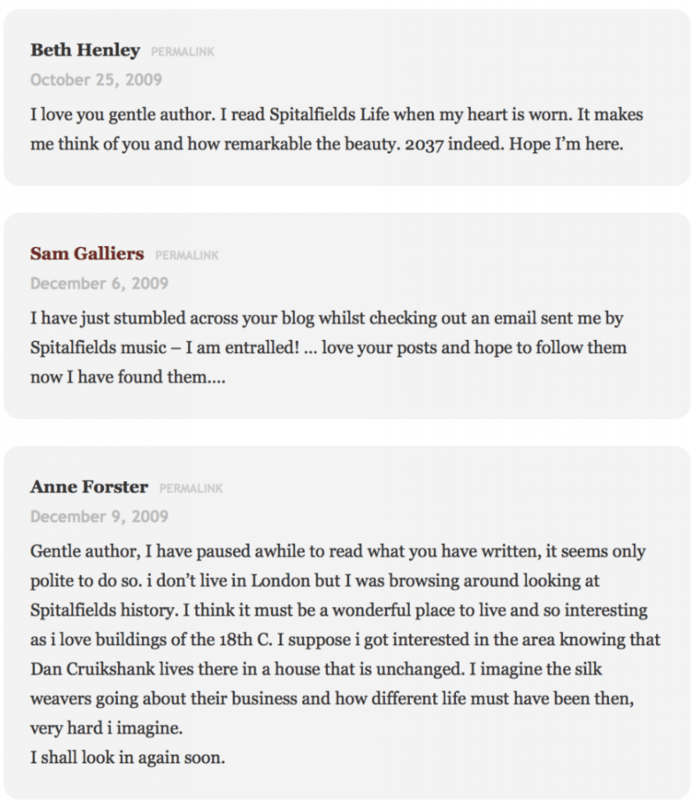 On the 26th of August in 2009, an anonymous blogger promised his audience a story every single day about life in Spitalfields. The identity of “The Gentle Author” is still shrouded in mystery to many – the blogging sphere has become overwhelmingly egotistical, according to TGA. “I found it very liberating to not be bound by my gender, my class or my race.” Having amassed over twenty thousand followers since that first post in 2009, The Gentle Author reminds us that in a culture that craves social media stardom, the opposite can be just as rewarding. His early anonymity guaranteed that the reader was interested purely in TGA’s writing, and not the online persona he had created. Perhaps this is a generational difference – TGA comes from an era before the craziness of Instagram, Facebook and Twitter, so I would imagine it being much easier to stop yourself from getting sucked in. The Gentle Author has eloquently told the stories of 1,500 people living, working and simply existing in Spitalfields. Through his literature on the Spitalfields Life blog, he discovered that his very own grandmother grew up a mere 50 yards from the house he lives in on Brick Lane. His writing is felt in the hearts of people living in different continents, and he is still working towards his goal of 10,000 posts by 2037.